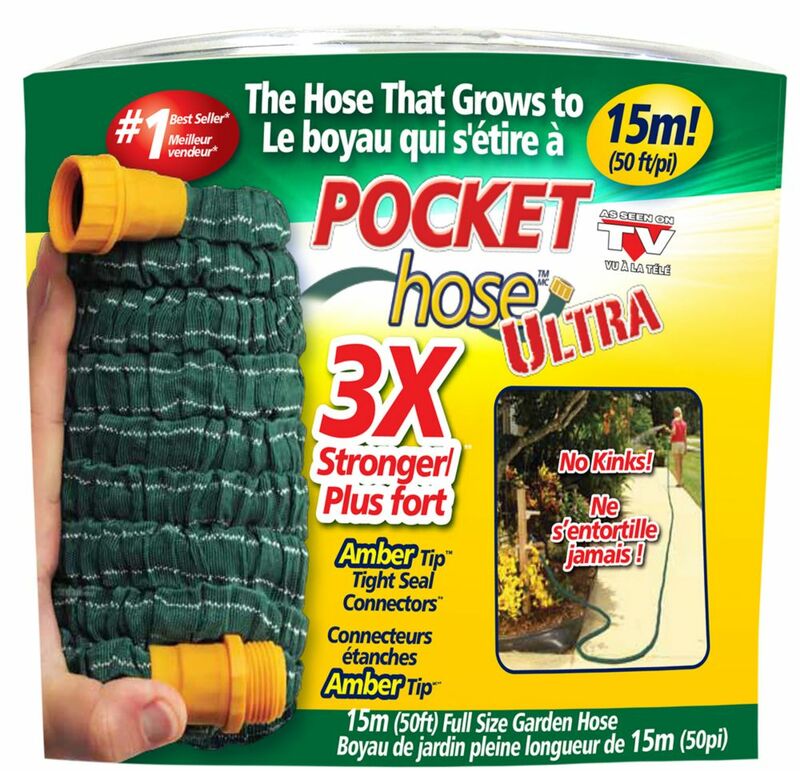 Pocket Hose Ultra 50ft, the hose that grows to 50ft. The #1 expandable hose in the world. Expands with water pressure/ contracts for easy storage. The secret is the accordion design that automatically expands when the water is turned on. 40% Lighter and Twice as Strong:This lightweight, red rubber hose is a major breakthrough in hose technology. It's designed to be 40% lighter than conventional rubber hoses, yet its special compound makes its sturdy enough to take on the most demanding of commercial jobs. it also boasts a high side pressure of over 400+ PSI. The Ray Padula Watering Kit is the perfect choice to start this season off right! This innovative kit includes everything needed to water any lawn or garden. Products include (1) Industrial PRO duty 5/8 in. x 50 ft. garden hose, (1) 8-Pattern Thumb Control hose nozzle, (1) Adjustable pattern Thumb Control hose nozzle, and (1) 5-piece Quick Connect kit making the entire set quick connect ready. The PRO industrial duty hose features Kink Shield and Water Guard technology and is designed to be used in the toughest of everyday lawn and garden settings. The innovative Thumb Control hose nozzles provide a triggerless operation with nothing to squeeze. Simply turn the nozzle ON, OFF and adjust flow with a push of your thumb. The Quick Connect set allows you to click-on, and click-off every item in the set for easy, quick changing of watering tools. Gardeners around the world have come to rely on innovative Ray Padula watering products for all of their lawn and garden needs. Ultra 50 ft. Pocket Hose Pocket Hose Ultra 50ft, the hose that grows to 50ft. The #1 expandable hose in the world. Expands with water pressure/ contracts for easy storage. The secret is the accordion design that automatically expands when the water is turned on. Ultra 50 ft. Pocket Hose is rated 1.0 out of 5 by 2. Rated 1 out of 5 by Daze from Poor Quality, Ruptured after only a Few Months Our condo has an outdoor garden terrace with no water supply. I run a hose from a connector under the kitchen sink. While this product is very easy to set up, it burst after only a few months use. Fortunately, the split was outside on the terrace. The mesh that surrounds the inner hose is very poor quality and eroded in several places (see image). I've read the same complaints about other brands of expanding hoses as well, and would stay away from all of them. Rated 1 out of 5 by coolhandluke from Garbage product I only used this hose a few times and it has already sprung a leak which renders it useless. Don't waste your money on this cheap junk hose.